Here are my two dress options. They are both sample sizes so a little small, but you get the idea. We are having a 1920's vintage wedding in Puerto Vallarta and I can't decide which dress to go with. HELP ME PLEASE. Any feedback, be honest would be appreciated. 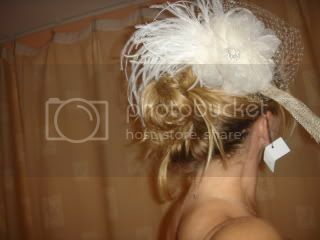 I am for sure going to wear a birdcage veil, like the one I have one, but of course in my size. I vote for the 1st one. I might be biased because I think I tried it on! I think it gives you amazing va-va-voom curves. Ooooh that IS a toughie! I think I'd have to go with #1 - it seems more "you" That and I love all the details on it, and think it will go splendidly with your gorgeous veil! A vintage wedding in PV - How FUNNN!!! First off both are gorgeous, but I am leaning toward Dress #1 ~ I am a sucker for intricate detailing and the top of that dress is ridiculously fabulous, and to me provides more of a vintage feel! I absolutely LOVE it!!!! My vote would be for dress #1 if you are going for the more vintage look. It looks great on you! I am going to have to say #1-I think it has more of the "vintage" feel to it. Plus, I really like the top of the dress! ohh i like the first! I'm more of a simple bride but with the veil and the theme I also vote for the first one. It's also very flattering!